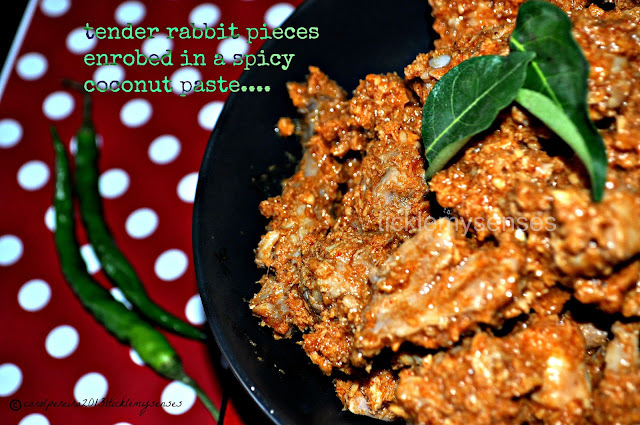 Tickle My Senses: Mangalore Style Spicy Rabbit Sukka/ Sukkha, Rabbit in a Spicy Dry Coconut Gravy. We have tried to keep warm, the heating has been running 24X7 and we've been through a lot of spicy comforting home food. Last Sunday hubby brought home a rabbit and without much discussion it was decided, that we were going to have our favourite Mangalorean Style Sukkha/ Sukka or Rabbit cooked in a rich spice infused semi dry coconut preparation. I usually make my mom's Mangalorean Chicken Sukka, Chicken in a Dry Spice Paste with Coconut . This time I decided to make a version I watched my MIL prepare. She usually cooks rabbit or country chicken this way in a little clarified butter or ghee, which she says helps to bring out the best flavours in the meat. 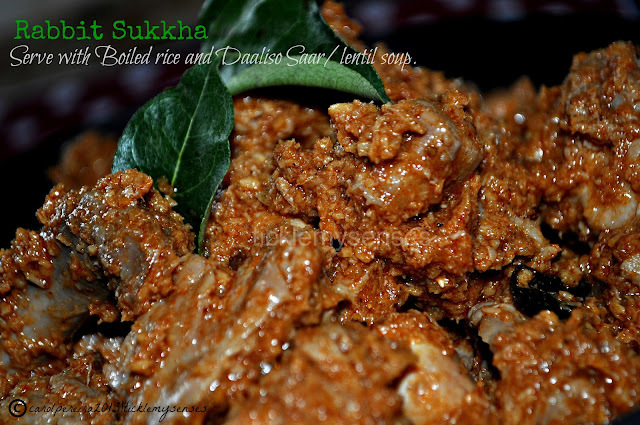 This sukkha/ sukka is truly lip smacking delicious, spicy and comforting, do give it a go. If you would like a simpler version, you could simply substitute the ground spice paste with the Mangalore Baffat powder ( available in most Mangalore Stores), add ginger garlic paste and grated coconut to the Baffat powder and pulse in the mixie 2-3 times to get a coarse mix. Then follow rest of the recipe as given below. 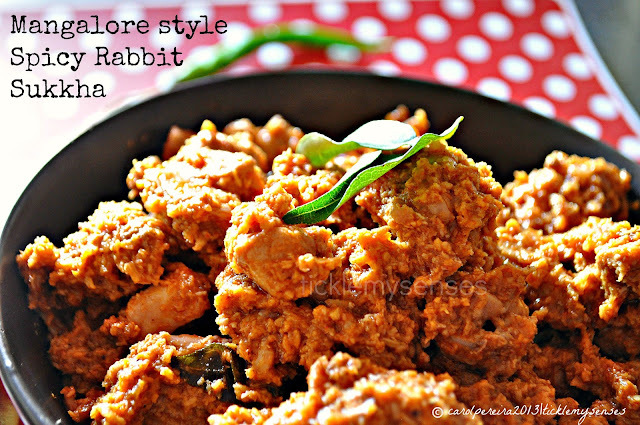 To make Mangalore Style Spicy Rabbit Sukka/ Sukkha. 1. Cut rabbit into medium sized pieces. Wash and drain. Keep aside. 2. In a pan dry roast the red chillies, mustard seeds, coriander seeds, cumin, peppercorns separately one by one - grind these ingredients to a fine paste along with the ginger and garlic. Add the grated coconut and pulse 2-3 times more to break down the coconut, but still retain its coarseness. 3. Heat ghee/oil in a vessel. Add cloves and cinnamon and curry leaves fry till aromatic, add chopped onion and fry. Once the onions turns light brown in colour, add turmeric powder and chopped tomatoes. Cook tomatoes till they turn soft. Add the rabbit and fry for 3-4 minutes. Add 1/2 cup water, salt, mix well close the vessel and allow the rabbit to cook till meat is 3/4 done. 4. Then add the ground spice paste, mix well and cook for a few more minutes till the rabbit is tender and done. Allow most of the gravy to dry, adjust salt. Squeeze over lemon juice and garnish with fried curry leaves. Serve hot with boiled or white rice, daaliso saar/ lentil soup and a veggie side. The recipe looks great but I don't know where to get a rabbit and I wouldn't have the heart to slaughter one if I did. I could do this with chicken and I bet it would be great. Thank you for this. 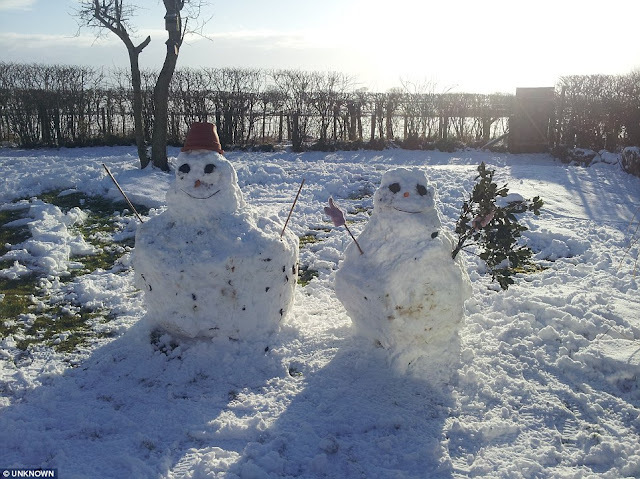 Please stay warm. Thankyou Divya. I hope you do try it out....it is yummy.